AP / Khalil Hamra)Syrian children play under the heat of the midday sun at Zaatari refugee camp, near the Syrian border in Jordan, on April 17, 2014. 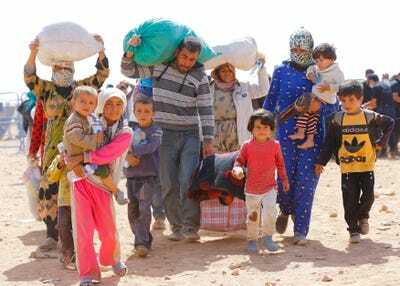 About 13.6 million people, equivalent to the population of London, have been displaced by conflicts in Syria and Iraq, and many are without food or shelter as winter starts, the U.N. refugee agency UNHCR said on Tuesday. “Now when we talk about a million people displaced over two months, or 500,000 overnight, the world is just not responding,” he told reporters in Geneva. 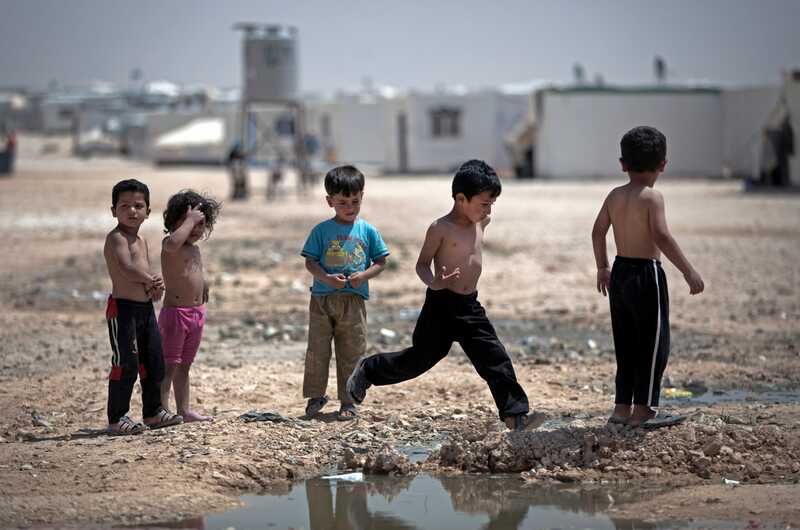 The 13.6 million include 7.2 million displaced within Syria – an increase from a long-held U.N. estimate of 6.5 million – as well as 3.3 million Syrian refugees abroad. In Iraq, 1.9 million have been displaced this year by tribal fighting and the advance of Islamic State, adding to 1 million previously displaced, and 190,000 have left the country to seek safety. The vast majority of Syrian refugees have gone to Lebanon, Jordan, Iraq or Turkey, which Awad said “are putting us all to shame” with their support for homeless Syrian families. Murad Sezer/ReutersKurdish Syrian refugees walk at the Turkish-Syrian border near the southeastern town of Suruc in Sanliurfa province, on Sept. 24, 2014. The U.N. World Food Programme has cut rations for 4.25 million people and lack of funds could force a break in its supplies next month for refugees, spokeswoman Elisabeth Byrs told Reuters. WFP recently received new pledges that may have averted immediate cuts, Byrs said, although it still needs $US325 million to cover its operations for Syria and the region for the rest of 2014. “Until these pledges are confirmed, WFP’s actual funding situation remains dire, with cuts in assistance anticipated during the upcoming winter,” she said. UNHCR says it is short of $US58.5 million in donations to prepare 990,000 people for winter, forcing it to prioritise help for people at higher, colder altitudes and for more vulnerable cases, such as newborn babies. U.N. figures show that leading donors include the European Union, United States, Japan, Norway and some Gulf Arab countries. The data show Russia and China have each provided just 0.1 per cent of the total humanitarian funding raised by donors this year for Syria. Awad said they should do more. “Politically they cannot really be indifferent, therefore humanitarian (aid) is an imperative and it has to be put first and foremost if there is no (political) settlement … They need to contribute one way or the other, like the others do,” he said.